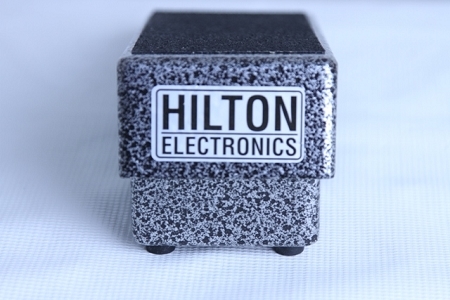 This Low Profile Pedal is the same sound as the Regular Profile, same mechanics except for steel players it brings about 1/2" more knee room under a steel by placing Hilton placing the fulcrum or axle in a different position than the Regular Profile Pedal. So, if you need more room for your legs under a pedal steel choose this pedal. It has 1 input on the right side of the pedal and 2 amplifier outputs on the right side of the pedal. There is an illuminated light on the left front side of the pedal to indicate that current is flowing to the circuit board inside the pedal. The pedal has a 90 day warranty and a 30 day free look included when purchased. If you ever need any assistance from Keith under warranty or at anytime, you will find Keith's service is the best. Unlike the foreign pedals that you have to throw away because you can not get parts, this pedal can be fixed easily by Keith. You only buy one and it will more than likely last years and years without any problems. OVERSEAS BUYERS WILL HAVE TO PAY USPS PRIORITY MAIL INSURED, WHICH IS AVAILABLE IN MOST LOCATIONS IN EUROPE AND AROUND THE WORLD. I WILL EMAIL YOU AFTER ORDERING AND GIVE YOU THE CORRECT SHIPPING AND YOU MAY SEND THE NEEDED SHIPPING AND INSURANCE THROUGH PAYPAL. You may pay here with a (VISA, MASTERCARD, OR DISCOVER )credit or debit card AND ALSO paypal.